Despite all of the strides made in women's rights, one of the main struggles women still face is equality in the workplace. In honor of Mother's Day, WalletHub and realtor.com compiled lists of the best places for working moms. Sunday is Mother’s Day, a time when we collectively celebrate all that our mothers have done and continue to do for us — inside and outside the home. Unfortunately, mothers (and women who are not mothers) don’t get their just due in the workplace. Despite all of the strides made in women’s rights, one of the main struggles women still face is equality in the workplace. Mothers (and women who are not mothers) don’t get their just due in the workplace. According to the Pew Research Center, women make 79 cents to the dollar, have a harder time moving up through the ranks, usually due to the thought that women can’t effectively handle being a great worker and great mother at the same time. States at the bottom of the list included Louisiana, South Carolina, Alabama — with Nevada ranking dead last. WalletHub identified the best and worst states by identifying 13 relevant metrics falling under three key categories: child care (40 points), professional opportunities (30 points) and work-life balance (30 points). Vermont came out on top with a score of 63.93 for its quality child care options (No. 1) and plethora of professional opportunities (No. 2). In addition to the list, WalletHub spoke with a panel of experts to get their opinions on how to best improve the plight of working mothers. According to the experts, states can most effectively shift more control into the hands of working moms through mandated paid leave, laws for unfair employment practices and improvements to child care, while employers should re-imagine workplace values to better include working parents. “Childcare costs– which are still privatized — surpass the cost of rent and average college tuition in many states,” said Laura Mattoon D’Amore, assistant professor of American studies and coordinator for gender and sexuality studies at Roger Williams University. Realtor.com took a similar approach to WalletHub, and rated each city based on career opportunities, the quality of child care and home affordability. Orlando came out on top due to the small pay gap. 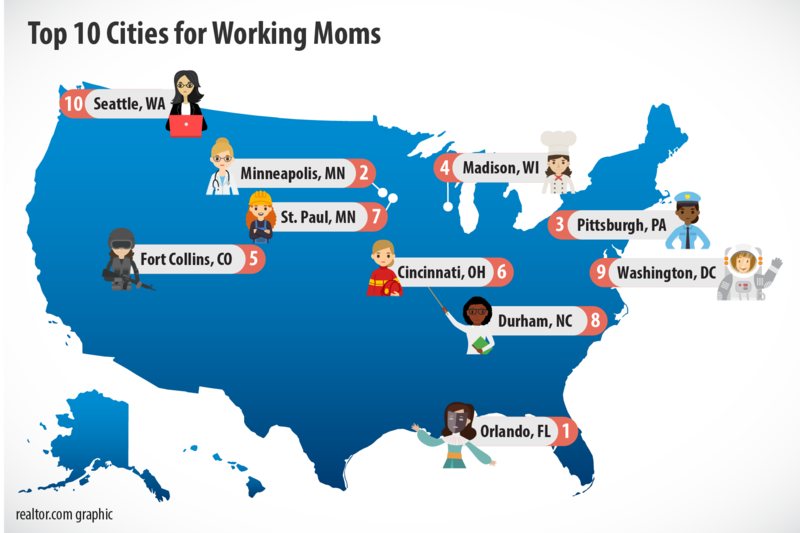 According to realtor.com, Orlando is the best city for working moms. Women in Orlando make 5 cents less than men — compared to the national average of 79 cents. Furthermore, the Walt Disney Company, the largest employer in Orlando, focuses on the health of their employee’s families by offering discounts to the theme park and other family-oriented activities. Lastly, Orlando is home to Protiviti, a global consulting firm that has an iGrowth initiative that is dedicated to helping women move up the corporate ladder.